I am going to do a bit more on Corso Court when I do an upcoming (as of 4/30/13) page on Avenue U, but sufficient for today is this street sign attached to the front of the building. 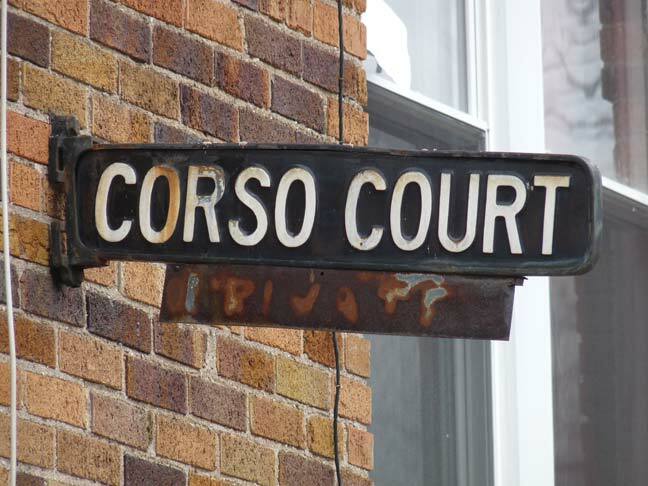 Corso Court is an alley off Van Sicklen Street just south of Gravesend Neck Road, in an area suffused with little alleys, some of which turn out to be colonial-era roads that originated centuries ago. Corso Court was likely a real estate development built in (perhaps) the 1930s. When I was growing up in Brooklyn in the Swinging Sixties, these were standard-issue signs, sharing the stage with “humpback” signs that showed the cross street in the ‘hump.’ I think the humpbacks first appeared in the 1920s, if not the late teens, while these were somewhat more modern and were among the first to feature the Highway Gothic font. They were also the first to feature the color-coding system given the five boroughs, with Brooklyn’s white-on-black scheme. Manhattan and Staten Island got black on gold, Queens blue on white and the Bronx white on blue, though I hadn’t seen a sign like this one in my limited Bronx travels as a youth. While these signs, which I believe appeared in the 1940s or 1950s, seem to have been made of porcelain/enamel and aluminum, later signs that appeared in 1964 were vinyl with metal clamps. Undoubtedly when those vinyl signs were installed throughout Brooklyn beginning that year, the family that owned this house salvaged the older sign and affixed it here, and here it has remained. More examples of this type were still in existence when FNY began publishing in 1999, but they have disappeared one by one, and I’m reluctant to reveal the locations of any stragglers. The Department of Transportation will remove them. Just a bit of “history”; many of the Van Sicklen family members lived in my area of Long Island. Edgar Van Sicklen photographed life in our hamlet from the late 1800s to early 1900s (buildings, many that are still standing today, parades, homes, farms, mansions, clammers). His descendants have donated all the photos to the local historical society. We had a very well attended exhibit 2 years ago of 80 of those photos. Hell,dont worry about the DOT removing them. My grandfather, Leroy Hallett, grew up in Gravesend in the first years of the 20th century but we don’t have much information because he was Native and African-American. I wonder if he was featured in any of those photos by the Van Sicklen family. I was born in 1948 and lived at 5 Corso Ct for about 11 years before my family moved to West St and Ave X. As a child going to PS 95, we used to play in the Gravesend cemetery and rode our bicycles in the alleyways. 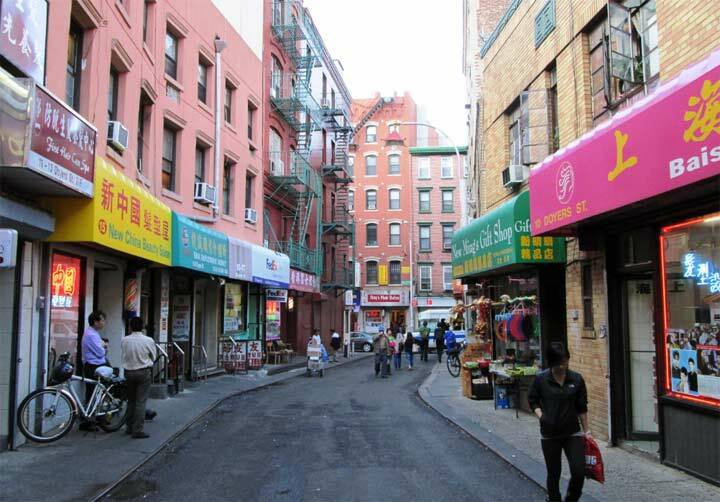 My mother used to shop in the stores on Ave U. I enjoyed growing up in that area. Does anyone know the origins of the name CORSO Court ? Street names were usually named after famous people.